The last two weeks have seen an immense public hue and cry about mortgage debt forgiveness. The spark seems to have been some relatively innocuous statements by Morgan Kelly at the Irish Society of New Economists conference, where he estimated that – excluding those with more than €500,000 in mortgage debt – the cost of a substantial debt forgiveness scheme would be of the order of €6bn. He didn’t say how it would or could be done or even make a strong case that it should be done, just that this was his estimate of the cost. This tallies with numbers I presented two years ago, which suggested that if the Live Register hit 500,000 and if house prices fell by 50%, we could have 50,000-60,000 households suffering both negative equity and unemployment. My own estimate was that total negative equity would be about €23bn, part of which would be owed by households with no income. Last week, economists’ musings were overtaken by a pseudonymous letter in the Irish Times, by someone from Kerry claiming to be starving his children to pay his mortgage. Unsurprisingly, his letter has provoked a strong response, not least by charities and government services, offering him advice and assistance. To the best of my knowledge he remains unfound but the impact of his letter and Morgan’s musings continues and can be seen on today’s front-pages. All three broadsheets lead with mortgage debt arrears and forgiveness. As of June this year, Ireland has 777,000 residential mortgages worth €115bn. Of these, 40,000 (or just over 1 in 20) are in arrears of greater than six months. This figure has doubled in 18 months, as it was 19,000 in late 2009. These 40,000 mortgages in arrears of more than six months are worth €8bn in total, but the arrears on them is worth less than €1bn. Court proceedings have been issued on 3,000 mortgages, a smaller number now than two years ago. There have been a total of 500 repossessions in the last twelve months. The majority (two thirds) of these have been “voluntary surrenders”, i.e. abandoned properties. There were 56 Court-ordered repossessions in the second half of 2010 and 103 in the first half of 2011. During 2010 in the UK, there were 36,300 repossessions, according to the Council of Mortgage Lenders. If the same rate of repossessions had applied in Ireland over the last 12 months, we would have seen 2,300 repossessions – i.e. about fifteen times the rate of Court-ordered repossessions that we have seen in the last 12 months. Irish banks gave out 673,000 mortgages between the start of 2005 and the end of 2008, the period most likely to contain the bulk of those in arrears. About 225,000 of these were either people switching lender or top-up mortgages. Of the remaining 450,000, 88,000 were investment mortgages, 145,000 were mover-purchaser, while 125,000 were first-time buyer mortgages. Ireland’s banks have given out 35,000 mortgages in the last eighteen months. At the same time, the number of mortgages has fallen by almost 16,000. This means that over 50,000 people have paid off their mortgage since the end of 2009, compared to the 20,000 who have slipped into arrears of six months of more during the same period. Between 2005 and 2008, one in six first-time buyers had a deposit of more than 30%, while one in five borrowed at 100%. Looking at the market as a whole, just under 40% of all mortgages taken out were at less than 70% loan-to-value. Someone who borrowed a mortgage of €300,000 in early 2006 and who has not missed a payment will, by the end of this year, have typically paid off about 13% of their principal, meaning their loan outstanding is about €260,000. A deposit of more than 30% means the home would have been valued at €450,000 or more. Such a home would now command an asking price of about €225,000. By the end of 2015, the principal outstanding would be about €220,000. Two million people were employed in Ireland in late 2006. 1.77 million were employed in early 2011, which means that about seven of every eight people who were at work in the boom are still at work. The 1.43 million households in the State in the 2006 Census were estimated to be worth €526bn collectively in early 2007. This had fallen to €289bn by mid-2011. Housing stock built since 2006 is worth approximately €42bn. To calculate net housing wealth in Ireland, mortgage liabilities of €115bn must be subtracted from the €330bn of residential housing assets, giving a figure of about €215bn. In other words, Ireland’s current “loan-to-value” is about 35%. Dramatic public clamour is often a recipe for bad policymaking. To butcher a phrase, “beware of Trojan horses bearing starving children.” 40,000 mortgages in arrears of six months or more is a serious problem but it does not mean even that 40,000 households are in arrears (some investors had many mortgages), let alone that 40,000 families are starving their children to cling to their home. Hopefully the facts above show that there is enough variety in Ireland’s mortgage debt to rule out any “get less indebted quick” blanket debt forgiveness schemes. Any write-downs of debt that do occur should be on a case-by-case basis and with significant strings attached (like not owning all your own home by the end). The vast bulk of people in Ireland are still paying off their mortgage and are still in employment. For those who are struggling and who believe that business-as-usual means they will not be able to pay off the mortgage as it stands, abandoning the property (and presumably emigrating) has proven an attractive option. However, there are less dramatic options. Central Bank figures show that lenders have restructured 10% of all mortgages. They have also put money aside – taxpayer money, the €5bn that Morgan Kelly was talking about and more – to provide for mortgage write-downs where families are struggling. Not only that, a recent High Court decision makes it much more difficult for lenders to repossess properties. The fact that there are fewer Court proceedings for repossession now than two years ago indicates that banks are not interested in pushing people on to the street, anyway. In short, no-one should be sacrificing their children’s health for their own financial wealth. Brilliant piece, I’m trying to pull some data on the market but it seems to be hard to get anything concrete. 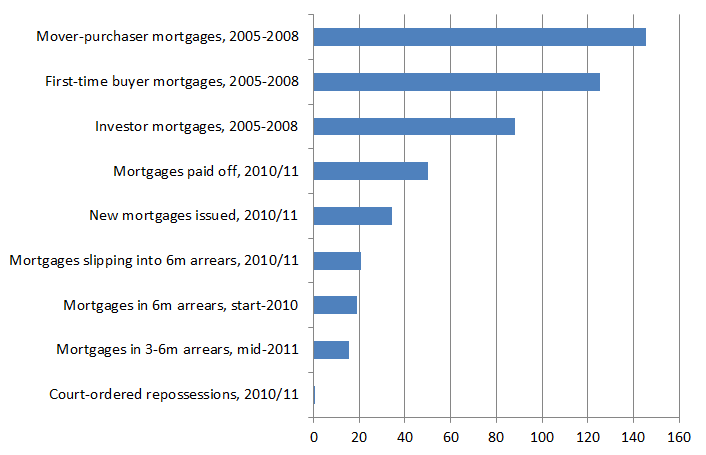 I pulled data from the CSO for all the mortgages issued from 2005-2008 inclusive at €84 Billion. I am trying to break this down into mortgage groups, FTBs, traders up, Investors… Is there anywhere I can get a more detailed picture on the mortgage market? I worked as a mortgage manager for quite awhile and I know the deep pain that this situation causes. Debt forgiveness, I believe, is a government OBLIGATION. If Bertie and Co. and not spent so much time and effort in boosting the housing market, reducing stamp duty etc., this overburden of mortgage debt would not be so large. I know the Central Bank are also on top of this – they will be releasing a lot of information later in the year, using the BlackRock stress-test data. There is talk of them opening up some data to researchers also, but that would be likely early next year at the earliest. It’s interesting that the letter from Kerry has fuelled the debate on negative equity as much as on debt forgiveness. Based on the details in his letter, they bought their house in 2003 for €130,000 and have an outstanding mortgage now of €80,000. It looks very unlikely given the time was bought and the amount of the outstanding mortgage that the house is in negative equity. The problem is purely one of income – that income does not cover the amount of the repayments. What the story does suggest is that there is a danger that the statistics may hide others with this income problem. The fact you are making all your payments does not necessarily mean you can afford to – let alone whether you are wise to. That’s not downplaying the worth of these figures though. Given “debt forgiveness” is a wide church with many different solutions suggested, we need to actually pin-point what the problem is to evaluate those solutions. We just also need to consider they might not be the whole story. All of your arguments may makes sense today. And that’s the problem with your argument. Tomorrow will not be as rosy.Following the budget in Dec and a resumption of ECB rate increases in 2012 and the 2013 budget in Dec 2012 – I suggest you and others may have a rather different view. Don’t be under any illusion the problem is chronic and there are many many thousands just under the threshold and it won’t take to much in the way of further income squeezing to push these families over the verge. This is why I think a blanket scheme may in fact be a more equitable way to proceed as it gets away from those potentially trying to game the system. A basic repricing of the asset class based on long run yield proxies at 7% and comensurate rebasing of mortgages on LTVs as per origination documentation will deliver everyone to what we all want. A property market and associated mortgage debt based in the real world. How to pay for this? -partly done already but the balance by way of telling the unguarnateed bond holders to take a hike. The unguarnateed holders do not form part of the Trioka agreement and are laughing all the way to their proverbial bank of choice. Why are we paying these guys and meanwhile averge Jos’s who were sold pups instead of houses continue to suffer and this is in a record low interest rate envirnonment – for now. Ask yourself another question: Would we give a damn if our neighbour arrnaged a debt write down because of a chnage in his/her personal circumstances if the banks were still in private ownership? I think most would say ‘good luck to you’ – the issue today is the fact that the citizens own these banks (more or less) and its the ownership issue that is getting in the way of logical commercial solutions. This is daft. Thanks Ronan, I was working on this last night, for the exact same period, 2005-2008, and then this morning you have presented me with what I need. Great minds…..
It’s a little worrying that the money has been allocated to the banks already. Top down appropriation of funds in Banks generally doesn’t get to where it is needed. Sorry. My two cents (which is now worth one cent!). I appreciate the article-it’s excellent, and I don’t doubt your figures. However, as is usual with statistics it offers the facts, but not the effects. You can’t ‘abandon’ a property in this country without owing 100% of the Mortgage on that property. Presumably these people go on the run and the state will spend inordinate amounts of money tracking them down on behalf of the banks? Also, it doesn’t matter if all these people you say are still working, they are ploughing hugely diminished earnings (which is one set of figures you don’t take into account) into ridiculously high Mortgages (which estate agents and websites pushed vociferously, and Banks agreed to the value of), with nothing left to spend on essentials. Never mind highly charged emotion – what about some core issues regarding financial gambling? 1. As rents fluctuate, why shouldn’t Mortgages? If a bank was willing to lend high amounts, shouldn’t they share some of the risk, and accept some kind of loss? 2. Most of these people were first-time homebuyers. I know you agree that a home shouldn’t be an Investment. However, Daft and the like always made great money out of advertising rental properties as well. It seems in this country that if you bought a second place to rent out you are now a vicious speculator that helped ruin Ireland, and must be left to bankruptcy (I didn’t do that, just in case you think I have any Special Interest, but I am all about not setting up divisions in Ireland now). I wonder how all the Students and Smug Renters of Ireland 2011, who used Daft.ie to find their digs, would feel about spending their four years in College living in Hostels, Hotels, or in the sexless atmosphere of their Great-Aunts? No investment in second properties (also agreed to by banks, and which has a long, long tradition in Ireland) would mean a great hole in what made Daft.ie and other websites a mint during the boom. It’s very well researched but it lets all sorts of people off the hook. And you will find that many of those who agree with you will be renters, people who speculated but got out on time, people who waited ’til now to invest. They also are a very small amount of people. Talking about debt forgiveness on a ‘case-by-case’ basis will result in utter chaos, fraud (as in men dressing as women to get on one of Titanic’s lifeboats), will set up huge divisions in Society and be a nice long-drawn-out earner for whatever stupid institution is set up to administer it. The ‘I’m not paying for other’s mistakes brigade’ will love it though. Unfortunately they’ve already paid on a Blanket basis for the Bank’s mistakes. And they pay tax on a Blanket Basis for Social Welfare, Maternity, Government, and Health etc. It’s (whisper it!) Socialism. Amazing, then, how when it comes to the people of Ireland actually helping each other out of a mess (Socialism! ), rather than a service or institution, that the place rears up and starts Class Wars and Blame Games. I may not like the big Property Speculator down the road, but I’m not going to watch him hang himself because he was ‘stupid’ (and they have). And I pay for the long-term unemployed already. Most first-time buyers never received one cent off the state. And when the entire world is telling you to do something, that it is aspiration, that it is part of the Capitalist fabric of life, I wouldn’t be surprised that some took the plunge. That the Banks, Government and Media were roaring approval and providing finance didn’t help. And I will not watch anyone hang so I can sit back, rub my belly and go ‘Ha Ha. You bought at the height of the boom, now suffer!’. We pay flat, across the board Tax Rates. And so it should be with Debt Forgiveness. Not the full amount. Just 50% across the board, so you are actually paying the value your property is at now. I know the big question is ‘where will the money come from?’ for that. I hope that’s something you can figure out for us in as forensic a fashion! > Two million people were employed in Ireland in late 2006. 1.77 million were employed in early 2011, which means that about seven of every eight people who were at work in the boom are still at work. Those those raw figures are correct, what about people who have left the country? Are there any reliable figures on people who used to live here, but now don’t? A break down by ethnicity would also be helpful to exclude migrant labourers, and irish citizens who’ve left. Restructuring on a case by case basis is a form of debt forgiveness. Presumably a restructuring makes a mortgage more affordable relative to income. In the U.S. restructuring by reducing the principal owed is the most common and effective mortgage relief scheme voluntarily undertaken by some banks. It reduces the principal, the monthly payment, and the interest rate. Presumably this is what you are calling for when you say “Any write-downs of debt that do occur should be on a case-by-case basis and with significant strings attached (like not owning all your own home by the end).” This is the type of debt forgiveness being agitated for in the US. While it is not happening on a widespread basis, it is happening in some places. n contrast the U.S. federal mortgage relief scheme does not reduce principal, it just reduces the monthly payment, with more payments due at a smaller interest rate. The federal program was designed to keep the mortgage on the bank books at full value and keep the payments flowing in to the banks even if the homeowner will eventually lose the house. Tim Geithner has admitted that it was a bank bail out in disguise and that it has in that sense been successful. It has been far less successful for homeowners. Abundant data prior to the initiation of the federal program showed that reducing the principal was the only effective form of mortgage relief. But the big banks did not want principal reduction. Securitization of mortgages, and the collapse of these securities, figured into the thinking of the big banks. So did the fact that they knew the federal government would give in to any of their demands, with no negotiation, as has consistently happened. kathyby makes a good point. Making mortgage payments does not necessarily mean they are affordable. Or wise to make. I suspect that close relatives may be helping, as it is a custom among middle class people in the USA to help children with their mortgages. Sometimes other relatives also step in in times of distress. Mortgage restructuring by reducing the principal, the interest rate and the monthly payment should help out almost all people in distress. This form of restructuring would also be a great benefit to the Irish economy. Ronan – interesting piece. However, Morgan Kelly’s comments could hardly be called ‘innocuous’ as they are picked up by international commentators and regarded then as facts. Given that he mentioned Florida with 20% arrears .. I assume he is also aware that ‘No docs’; ‘No Income and No Job’; “2% teaser rate rocketing to 8-10% on repricing” were all central to many mortgages in the US particularly Florida and California. Its about time we got ‘facts’ here now rather than opinion. For example we should immediately move to have all mortgages, deposits and property forced to have PPS numbers so that we can once and for all start seeing the actual position. It is now getting to the state that if one is asked about what somebody should do if they are under some stress financially – why not stop your payments. There appears to be little consequence. In the UK during the 1989/1990s it was a ‘case by case’on arrears.Thats where we need to be going. The numbers of Mortgages in arrears is only going one way in the medium term. The Central Bank said yesterday 55,763 home loans, or 7.2 per cent of all mortgages, were in arrears for more than 90 days at the end of June. This compared to an arrears level of 6.3 per cent three months ago, and 5.7 per cent at the end of last year. If we continued to see an extra.9% go into arrears for the next 18months that would be about 20,000 more mortgages. Every 10,000 mortgages in arrears equates to a mortgage value of about €2 billion. If you wrote off 40% of the debt of all those currently in arrears plus 20,000 more allowing for those that may go into arrears in the next 18 months it would cost 6 billion. So Kelly’s figures make sense in my mind. >> To calculate net housing wealth in Ireland, mortgage liabilities of €115bn must be subtracted from the €330bn of residential housing assets, giving a figure of €215bn. In other words, Ireland’s current “loan-to-value” is about 50%. Shouldn’t this be a figure of €215bn? With a loan-to-value of about 65%? Well spotted – the figures looked so round I didn’t even take out my Excel to double check! I’ll adjust the article accordingly (the LTV actually goes lower, not higher). Paddy, some strange points, which seem to be more about emotion than logic. Once per year, the rent can be reviewed up or down based on the market achievable rent. The tenant can leave if they don’t like it and go somewhere else. A mortgage, on the other hand, is a 20-35 year long contract, where you borrow money at terms that are clearly set out, and promise to repay it every month, and at the end of it, you own a house. When you sign up for a mortgage in Ireland, you sign up for a full recourse mortgage. This means the loan is secured on you, not just the property itself. This is not new, this is what people sign up to. “2. Most of these people were first-time homebuyers”. The rest of your post is just a bit of an aimless rant. “Smug renters of Ireland 2011” indeed. You are trying to paint a picture of the poor first time buyers being the majority of the spenders at the peak of the boom, but they are in fact in the minority, by a long long way, to all the amateur landlords, top-up-mortgage-for-a-flat-in-bulgaria-or-a-BMW-X5 crowd. I do, however have a solution for you Paddy. All you ask is “Just 50% across the board, so you are actually paying the value your property is at now.”. I suggest that the money that people made in the boom is taken back off them. People made out like bandits on the way up, and now they want to socialise the losses on the way down. The only fair and equitable way to do it is if profits made on house sales in the years 2000-2006 are re-claimed and used to pay of the mortgages, top ups, BMW-X5’s and bulgarian apartments of those who found themselves at the wrong end of the boom. Paddy, do you want me to pay for your mortgage for you? Is that it? If we assume that 15% ( a high delinquency rate ) of the 125,000 FTB mortgages issued from 2005-2008 are in trouble and/or a consensus be made that this is the priority group, and assume an average €200,000 mtg ( greater than the average, but we need to allow for higher LTVs) then the TOTAL exposure to this group is €3.75 Billion ( quick calcs ) If we take this group as a whole it represents 18,750 mortgages. Surely this can be processed fairly quickly initially through the lender, and to the courts for approval. But this €3.75 Billion is not the total loss. If we assume a worst case scenario, of a drop of 60% in peak to trough in the property market, we can re-coup, at worst, €1.5 Billion. This leaves a net possible loss at €2.25 Billion. Obviously there is a need for a NAMA for the residential market. It may not appeal to the masses, or those who think that wanting to own your own home is “bad”. Some people genuinely bought into the Irish dream, and now they are suffering. I will leave it to the more educated economists to calculate the boost to the domestic economy as a result of the much needed boost in disposable income a blanket scheme proposed like this could provide, I’m sure it will help. Aside from recent stringent stress tests etc, there is a usual provision in banking for perhaps 6% ( Guess! ) debt write-offs. This can be further discounted from the cost to the taxpayer. Total direct liability could be less than €2 Billion if we cover the extra 9% not accounted for “normally”. b) A Mortgage may be a signing up to a ‘contract’ with a ‘Bank’ but that’s like saying ‘a cop is a cop so he can’t be crooked’ or a ‘Bank will always lend less than it has coming in’. We were all pawns in a speculative game being played worldwide by the lenders. We saved hard for deposits and then were given money by the banks, which they possibly had no right to give, according to the rules of ‘ability to repay’. I wish we were more like Germany where the deposit had to be over 50%. But we weren’t. And people needed homes. I see that the amount of First-time buyers is low. My bad. If I said ‘some’, would that help? That said, in relation to the Beemer-and-Bulgaria types, let someone do some analysis of that figure and break down exactly what the mortgages were for. Were they all for Beemers and Bulgaria? Did some parents remortgage to give their kids a step up? Or buy an apartment for them? I don’t know myself. But you have two hopes of getting the money back for all that mad spending that…oh…wait a minute…via every kind of Tax imaginable had the Government’s coffers bursting at the seams. Remember the amount of Tax Generated from these ‘crazy purchases’. The Government wasn’t exactly telling everyone to calm down – in fact, from what everyone here is saying, most of you should already be dead from Bertie’s advice to commit suicide. I’m glad all of you were wise. And that logic is paramount. But what’s more important than ‘logic’ is that something has to be done. You can’t just push the ‘You have to honour your contracts’ line. The contract is invalid because it was never viable. 1960’s Music Contracts are less dodgy. The Banks screwed up and now need to play ball. Of course if we had our own currency and didn’t owe Europe so much we could change everything. I don’t know what the answer is, but it certainly isn’t the ‘You took a risk now live with it. Or die with it.’. The Banks did the same and were recapitalized to the hilt. No more doing the way things they’ve always been done, because it never works out. All of our taxes go into one fund, it’s in the constitution, and is divvied up by the Government according to – oh, I don’t know, what’s important or something. So remember, if you have kids (Maternity, Children’s allowance) or smoke or like to play Rugby and break your arm (health) or lose your job have to go on the Dole someday, we all have to pay for that too, even though some of us have none of those things. I wouldn’t say you have a neck for requiring the help, as much as I wouldn’t renege on my Social responsibility to do so. Everything is risk, and though we as individuals take risks, we don’t get to pick and choose what types of risk we pay for as a SOCIETY. Unless you want that kind of Society? In the meantime, if I pay my Mortgage, and you don’t lose your job, we’re quits! Happy days. A thought provoking piece (picked up via a link from the FT). In 2006 euro 300,000 loan with a 10% deposit implies a house price of 333,000. This loan is most likely interest only and not repayment and a 10% deposit is more likely than the 30% one quoted. Fair point. Although it’s my understanding (Morgan Kelly has run some numbers on this) that most interest only loans were to investors, not FTBs so while the problem may exist, it’s not the same as the one making the headlines in Ireland at the moment (owner occupiers in trouble). More generally, the point I was making in 8 was really just a follow-on from 7 – a far greater proportion of loans in Ireland were sub-70% LTV than people often think. Paddy you decided you were sick of renting, you got your timing badly wrong and you are now sick as a dog. That’s about the height of your argument. Try going to a judge and “air-quoting” the word contract and see how far that gets you as a defence. You wanted the “security” of owning your own home, well now you have it, I hope you are enjoying your home and the non-magnolia walls. You then go on a big whinge about taxes. The government did indeed encourage the property boom. They stoked the fires at the worst possible times. They looked the other way and let the banks run wild. However, Bertie and co. were not parachuted into Leinster House (three times in a row) at the behest of “The Man”, they were elected… by a LANDSLIDE victory at the height of the boom. The majority of people were on board the gravy train and loving it. People who bought apartments for their kids to go to college… eh.. am I supposed to feel sorry for them? Could the kids not have rented like normal people? The banks screwed up, and they were punished: The shareholders were wiped out. They were propped up because the government decided against having a social experiment to see what happens when banks are allowed to go bust. Thats life. Two wrongs do not make a right. What is needed is bankruptcy reform. People cannot be allowed to hold onto assets but have the debt they took on to purchase those assets written off, stop looking for a freebie, the debt fairy is not going to come along and make you feel better. Niall, why on earth should debt releif be an obligation for government ? In other words you mean an obligation for the TAXPAYER who is being used to bail these banks and the negative mortgages they hold. I dont own a home, I pay rent and pay hefty taxes. Why should my tax money be used to pay other peoples mortagages off – if they do then surely the government (i.e. taxpayers) should make a contribution to paying my rent as well. I have no vested interest myself, I prefer to rent. We see that the government has already allocated the funds to the banks so we are paying for it anyway. At this stage the argument should be where this money is spent? FTBs are usually young families, graduates etc who are not making an investment, they are trying to buy a home. The government has a duty to disseminate responsible and sound information to the public. Take this Economist article from 2005 which highlights the bubble. It is one of many from the time. The Irish people should have been warned about this hazard and fiscal policies should have been immediately enforced to cool down the market. But nothing happened. No disincentive to buy your first home. All indicators falsely pointed to “buy”. Yeah the investors should suffer, that’s what they did, invest. Saying that, it is hard to devise a blanket scheme which can address every issue. You can’t keep all the people happy all the time, but I’d way prefer to help that young family down the road than any other group of mortgage owner. Niall, I have absolutely no problem with the government bailing out negative mortgage holders, if first the property speculators and parasites who filled their boots during the boom times return all of their unearned profits back to government treasury coffers and that money is used to bail out negative mortgages. That will not happen will it so what you are advocating is the direct privatisation of profit and the socialisation of banking (corporate) losses. The people who will pick up the tab of the failed banking sector will be both public servants who lose their jobs and pensions because of govenment cuts as well as many people in the private sector. Nobody forced people to buy into the utter madness of the property market, many people who bought thought they were going to make fortunes from it in unearned income when they came to sell up, and many were bitten by their own greed. Now why should hardwoking taxpayers who are already stretched to the hilt bail out these mortgage holders ? There is going to be a much larger drop in prices – at what point will the bailout stop – will there be a mark-to-market re-calcualtion every few months and a new bailout each time ? We socialised our debt in September 2008, this happened a long time ago. And then we chose to concentrate on loan portfolios greater than €5 Million ( NAMA ) to try to manage these massive debts belonging to speculators etc. I’ve never met a mortgage for €5 Million for a FTB. There is no correct answer, there is only a way to try and minimise damage to the economy, and hopefully maximise societal benefit. With the low levels of repossessions at present there is a possibility that there are undeclared problems in this market. So if we have committed the money already, why not try and get it to the people who matter the most??? Forget about negative equity. People will still pay if they can afford. This is not the issue. The incentive isn’t enough to walk out on a job to save “theory” money. The problem is arrears. People who cannot afford to pay. This can be managed to minimise cost to everyone, or it can be ignored and it will become another bubble in another form. If we can direct aid now, it could prevent further losses down the road. But I agree. There is no right answer. There never will be. Niall, I agree the banks losses were moved from their own balance sheets onto treasury balance sheets, but this was with the intention of the loans being repaid and the taxpayer hopefully getting their money back. It was a loan from the treasury to the banks it was not a free gift, that was the reason there were bailouts, this was a temporary loan and not a permanent measure. There were no stipulations in the bailout conditions that allowed individual bank loans to be defaulted on and be allowed to stay open and on the books without repayment or reposession. Like I say where do you draw the line, prices will continue to drop for a long time, do you want a single bailout or multiple bailouts every quarter or every year ? There will be massive losses everywhere, individual cases and large scale. But allowing the direct socialisation of this kind of loss is technically very difficult and morally very wrong. I would love to run a company or a bank which could just run up massive losses then just go to the taxpayer cap-in-hand for a bailout every time I made some stupid decisions, but where would it end ? To direct aid in such a way merely would indicate to banks and borrowers that its okay to make such stupid risks acceptable in the future because if it all goes wrong again the taxpayer will just pick up the tab. Well let me tell you the taxpayer will not pick up the tab on this one. Although the unemployment rate is still on an upward cycle, it has generally flattened over the past few years. So we could be hopeful that we are near peak. So if we have approached bottom in the labour market, at present we may be at the most constrained in terms of disposable income. So for arrears it may be the time to act. The bottom of the housing market may be some bit off, and austerity has many more years to run. I doubt that there will be any sustainable increases in house prices in the near future, but I would equally doubt that the market has a lot more to fall. There is limited data available on the breakdown of mortgages. It is a dampener on economic activity to have these stagnating within the system. Funds will be provided for mortgage write-downs. It has already. Even if you don’t want to pay, you are. It is important that the government i.e. the people, makes sure that these funds make the way down to the bottom of the system. Banks are capitalist in nature. They will try to maximise their own profitability, at the expense of you, the taxpayer. I don’t need to explain what has happened before, and as a taxpayer in this country I want to see my money spent on something more important than Anglo Irish Bank etc. Unfortunately the negative equity trap represents another dampener, but when people entered into the mortgage there income was assessed. Mortgages are provided as a percentage of net monthly income e.g. repayments can’t be more than 35% of net income. The negative equity trap only materialises when someone can’t afford to pay the mortgage anymore, or if they have to move for work etc. Can we help this group? I don’t think so because it would provide too much of a moral hazard. We need to concentrate on only those in arrears at present. The negative equity trap is the punishment within the system for those you consider “greedy”. There is no way to help everyone that got into this mess, but we can try to pull out those at the bottom. Ronan, your analysis of the data was erudite. There is a danger in all this talk of mortgage forgiveness. That is a sort of moral hazard danger. It has happened big time in the US. The whole process of ” mortgage re-adjustment” takes a long time. But word travels fast. You see I think the danger is tens of thousands of people will say: look at them, they are behind on their mortgage…… And nothing has happened to them and now it looks like they are going to be released of their obligations. They get to keep the house and get the mortgage sliced down. Why don’t we do that? Let’s stop paying the mortgage…. So the problem gets bigger. You mention that the 40,000 mortgages in arrears have a total value of €8 billion, but less than €1 billion in arrears. Does this latter figure include the total amount to be repaid, or is it merely the total of missed repayments? Comparing repossession rates in Ireland with Denmark there are almost no repossessions worth speaking about in Ireland. Denmark, a country with 5 million inhabitants (~similar to Ireland), had approx 3.700 repossessions in 2010. This is of owner occupied dwellings. Compare that to 500 repossessions in Ireland! Note also that Denmark have a relative sound economy opposite to Ireland. When the repossessions toped around 1990’s crises there were around 10,000 repossessions a year in Denmark. Here in Denmark repossessions is not really any big deal, just a fact of life. It is not on the political agenda at all. I think we find it hard to understand what the fuss in Ireland is all about. In most cases someone loosing their home(s) to repossession can rent private and continue life in the same community and with the children in the same school. Perhaps trade down the 4×4 to an old banger. In by far most cases, some whose home is repossessed does not loose his wife! Life goes on. Buy the way, Denmark does have a “debt forgiveness” legalisation where creditors can be forced by the courts to write down a percentage of debt, that have no realistic change of ever being repaid, so it becomes manageable. But don’t be mistaken about it, it is not a giveaway. In most cases one are better of negotiating privately with the creditors. 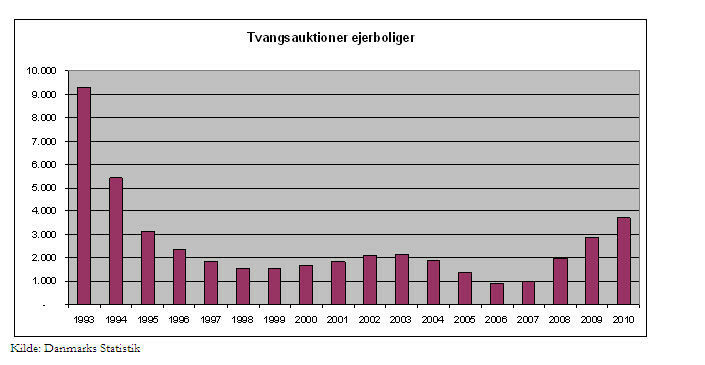 Link below shows yearly repossession in Denmark of owner-occupied dwellings. Less of the snipy ‘tone’! We’re either having a discussion / debate or a character assassination! I’m not ‘whingeing’, nor am I ‘sick as a dog’. I am allowed to take on other people’s difficulties as a concern (that’s community spirit by the way), even if I don’t have as much difficulty. And ‘The Debt Fairy’ came already to the banks, the Bondholders, the developers, the unemployed and people with kids! Just making sure the Debt Fairy socializes his wand-waving! Agree with you about the Government of those days (whom I never voted for), but again I will say that there should never have been a ‘wrong time’ to buy, were proper regulations and practices in place. And Students should never have to live with Magnolia either. It drives them to drugs. In the end, I completely agree with you on one thing – Reform of the Bankruptcy Laws. That would get rid of the Debt Forgiveness issue completely, and then we would all be happy. Ronan, a close friend works for one of the main banks and her/his main role includes pulling reports on, amongst other things, levels of arrears. He is repeatedly stunned by the apparently very low level recorded by the databases he uses. However, he believes that the real figures are distorted by the way the banks report arrears – or even what they consider to be arrears. Until there is a consistent way of reporting that is applied the same throughout the banking system, many of the reports will not be accurate or meaningful. My perspective is a legal one, not an economic one, and perhaps out of line with others; it is not mainstream. The Banks, the Central Bank of Ireland, IFSRA, the former Minister for Finance and the State collectively and severally failed in their duty of care to the consumers of bank lending in respect of principal private residences. It would take a 60 page statement to outline the various breaches (including statutory breaches) and to explain the specific bases of the various breaches. A cursory outline is that the purchase price of homes, new and second hand, was almost entirely a function of excessively liberal capability to borrow, not a matter of capitalisation of predicted rental value, not a matter of supply and demand and not a function of the input costs such as construction, services and site acquisition costs etc. The Banks dismantled the principles of responsible lending. Fractional reserving was ignored. The DoE Certificate of Reasonable Value was dispensed with, the limit of repayments, not exceeding 35% of net after tax income, was cast aside, the limits on multiple of gross income were ignored. The fact that there was an obvious housing bubble and over supply ignored. Residential property values quadrupled in the 10 years from 1996 to 2006. The multiple warnings from FDI sources that Ireland was becoming too expensive because of residential rents and residential property values were conveniently ignored, residential property values on a per square metre actually over took prime property in the UK and in major European cities. There was a contrivance, encouraged and induced by Bank lenders, to have prospective borrowers over state incomes for borrowing purposes. There was no risk distribution of lending. Bonuses, over time and discretionary benefits, were taken into account for loan eligibility purposes. I can identify another 10 major and egregious breaches of care. The worst was giving 100% and even 105% mortgages and ignoring LTVs. The security value became the primary consideration, not capacity to repay. The ordinary house buying consumers were hyped into buying at excessive prices, artificial queues were created and lenders and mortgage brokers urged the ordinary financially unsophisticated, non expert consumer buying her/ his home, to buy as early as possible and to go in as deep as possible. The unfortunate consumer naively thought that the Irish Banks were subject to prudential supervision. Put baldly, and I can say this as a non victim, the first time buyers and the buyers trading up were mis sold inflated value assets. They paid extortionate and uneconomically sustainable prices for their homes. State policy encouraged this. Efforts to slow down the asset value inflation were set aside. The reality is that the well remunerated and bonus driven bank lenders and the rather comfortably remunerated Regulators acted recklessly and irresponsibly. The victims were the non experts. It is not an abdication of responsibility to say that the experts must bear the primary, if not the entire legal responsibility for what happened. Anyone who bought a home from 2002 to 2007 paid a grossly excessive price for their home, comparing the purchase price to a multiple of the likely annual rent. Sadly, the number of people in arrears and the amount in arrears will inexorably and steeply increase over the next three years. The victims were subjected to an improvident, oppressive and unconscionable bargain. Eventually, but it will take a lot of time for the full realisation slowly to dawn, it will be sadly and lately realised that the mortgage debt burden is unsustainable as net incomes reduce or disappear, where the housing market is frozen, new lending is drying up and residential properties are continuing to decline, not having reached the bottom. Unless or until there is radical intervention in the form of significant mortgage principal write down (subject to tight eligibility criteria), those people unfortunate enough, due to age and circumstance, to have bought from 2002 to 2007 in particular, will be burdened with a permanent yoke of debt. Even as far back as 594 BCE, Solon the Law Giver of Ancient Athens understood the concept of the shaking off of the burden of debt. I accept that it will take time for many to come to the realisation that we are facing a massive wave of mortgage debt impairments which will cause a crisis of confidence in the capital robustness of the Irish banks. Even if you ignore legal considerations, laugh dismissively about ethical and moral considerations, harden your heart and seek to extract maximum repayment from distressed mortgagors, the fact is that even an innumerate and economically illiterate lawyer can understand that “can’t pay” is its own answer and its own undeniable reality. Every distressed mortgagor would be well advised, in defending mortgage repossession cases in Court, specifically to plead a breach of duty of care on the part of the Bank lenders contributed to by so many others. To borrow from a more original and far more perceptive commentator, the Pope’s children were betrayed. Personal Insolvency Schemes are desirable but no one should be rendered insolvent and needing to avail of such a scheme as a result of being a victim of the “Great Housing Scam”. People paid far, far too much for their homes between 2003 and 2007. A solution which ignores that reality cannot be a true solution.